The Kentucky House of Representatives, on a vote of 97-0, passed House Bill 495, legislation authorizing a plan to pay interest payments on federal loans made to Kentucky to pay unemployment insurance claims over the past three years. “Because of the difficult economy we are just now emerging from, Kentucky’s demand for unemployment insurance has skyrocketed in the past several years,” says Rep. Larry Clark (D-Okolona). HB 495, sponsored by Rep. Larry Clark is projected to save Kentucky employers $600 million in federal unemployment tax increases slated to take effect as soon as the fall of this year when a federal unemployment tax credit employers ordinarily receive would be eliminated. If the interest was not repaid, taxes would have increased by $600 million, placing a significant burden on employees and employers alike. HB 495 authorizes the state to borrow funds to make the interest payments due. Beginning in 2014, employers will see a surcharge of .22% of each covered employee’s first $9600 in wages. Revenue from that surcharge will be used exclusively to repay funds borrowed to make interest payments on the federal loans. 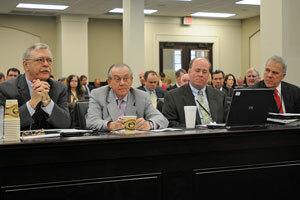 HB 495 has the active support of the business community including The Kentucky Chamber of Commerce, Kentucky Retail Federation, Kentucky Homebuilders Association, the Associated General Contractors, the Kentucky Association of Manufacturers, the Kentucky Federation of Independent Businesses and the Kentucky State Building and Trades Council. The bill now goes on to the Senate for its consideration.